New York, Los Angeles, Sydney, Shanghai, Barcelona, and Dearborn. What do these cities all have in common? 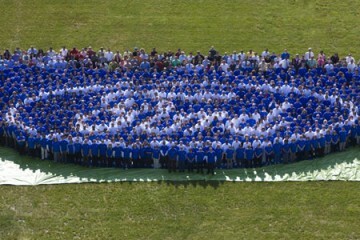 They are the locations for Ford’s simultaneous global launch of the 2015 Mustang. We were live in Dearborn as Chief Operating Officer Mark Fields, along with key members of the design team, pulled the tarp of a bright red GT. 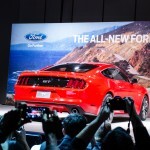 The fastback design has returned to the Mustang, along with other throwbacks to the original design. However, it is a striking modern approach to the classic car. 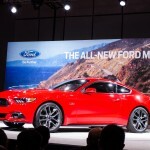 2015 Ford Mustang in the metal. Visually, the Mustang is all new. 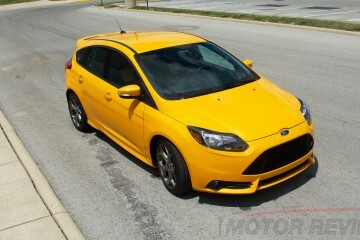 In the front, it retains Ford’s design language, but has a much sharper personality. Design head J. Mays described it as a “shark nose,” and with the gill LED daytime running lamps, it is an accurate description. 5.0 badging remains on the GT model, but the grille-mounted fog lights are moved to a more traditional location, with a turn signal strip just above. The fastback design has returned for 2015. The biggest change in profile view is the return of the true hatchback. According to Mr. Mays, they raised the greenhouse some in order to put a bigger slope in the back window to the rear-end. 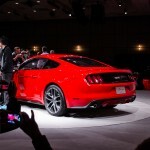 The GT model shown has a rear spoiler on the trunk lid. Sequential LED tail-lights remain, but will not make it to the European version (EU regulations prohibit the design). 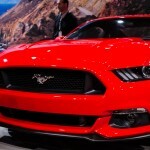 The rounded Mustang logo is gone, and replaced with just “GT” badging. 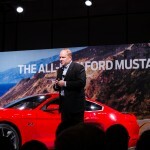 J. Mays talking about the design of the new Mustang. The B-pillar has been darkened to make look like a pillar-less design. Wheels will be as large as 20″ in size, with 18″ as standard. Larger brake rotors all-around help bring the (approximately 200lb lighter than previous model) Mustang to a halt. Brembo-branded brakes will also be available. A turbo 4-cylinder returns to the Mustang with the 2.3L EcoBoost. 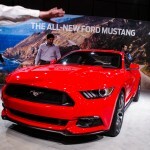 The 3.7L V6 returns in the ’15 Mustang, making over 300hp. 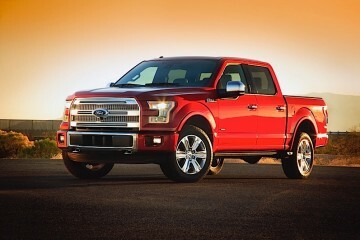 Expect to see a horsepower increase on the 3.7 as well as the 5.0. 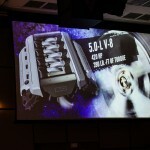 The 5.0 is also returning, though redesigned to be more powerful and more efficient. 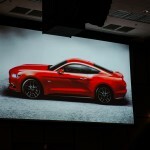 The 5.0 Mustang will hit 155MPH, though that is probably electronically limited. 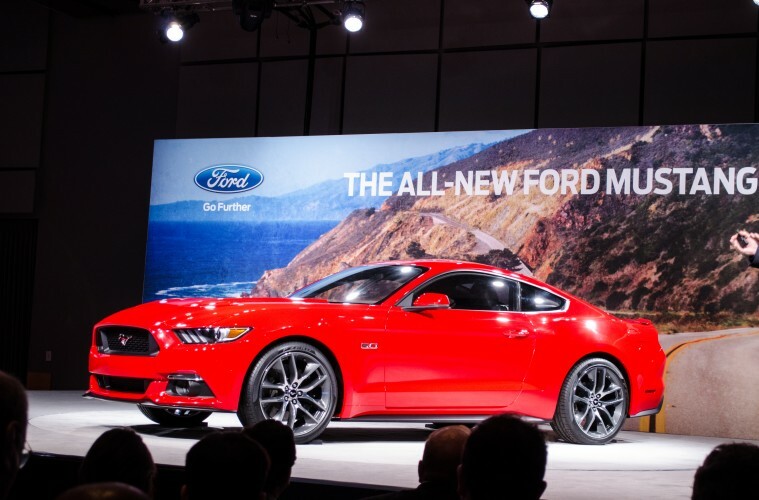 The 5.0 returns in the new Mustang. 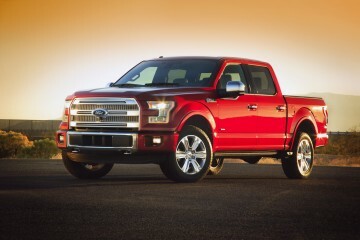 The biggest change in engines is the 2.3L EcoBoost 4-banger. This engine debuted in the new Lincoln MKC, but will make over 300hp and 300ft/lbs of torque in the Mustang. 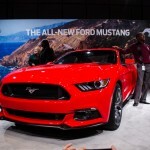 Ford did not say in the 4-cylinder turbo will carry a special nameplate (like SVO), but representatives admit that there are several more Mustang related announcements in the months to come. The “best handling Mustang” ever features a fully-independent rear suspension. 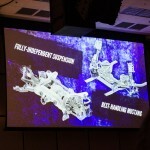 The most talked-about change in the buildup to the launch is Ford’s decision to dump the live-axle rear-suspension and replace it with a completely modern independent unit. We are partially disappointed that the live-axle is gone, and partially pleased by the decision. 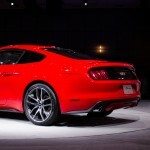 Though not visible, the biggest change to the Mustang is the rear-suspension setup. A Porsche 911 has always had the engine in the rear, over the rear-axle (practically in the trunk). Engineers at Porsche worked around that trademark design to make the car one of the best-handling cars on sale. 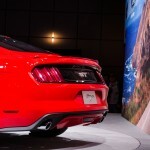 The live-axle rear-end on the Mustang is a trademark of the brand, and previous versions handled very well considering that limitation. However, to be world-class, everything needs to be world-class. We believe the Mustang is striking, but it is growing on us. 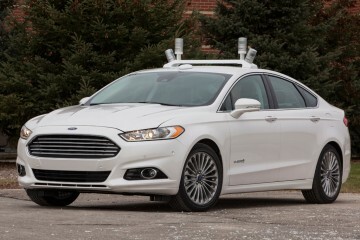 Ford is keeping it simple with the transmission choices. 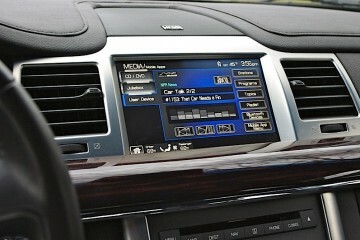 The 6-speed automatic remains, but paddle shifters have been added. Luckily, the 6-speed manual transmission is also retained. We believe that many enthusiasts will opt for the manual transmission, the automatic will be the best seller. We wouldn’t be surprised if the manual-transmission really makes the 2.3L EcoBoost shine. 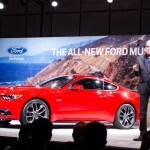 Ford claim the new Mustang is also the most technologically advanced Mustang ever. Little was discussed about the newly-designed interior, but J. Mays emphasized the desire to have a tactile feel. 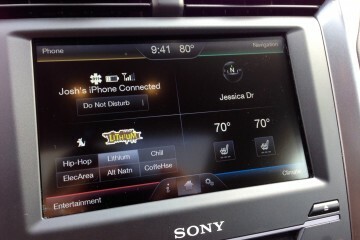 That means the MyFord Touch interface is mostly button-controlled. Also, most of the driver-control features will be accessible through a toggle, instead of via a menu in previous versions. Also new for 2015 is the inclusion of computer-controlled Launch Control on the GT. In the past, it was exclusive to the Shelby GT500. We believe there are more Mustang surprises in store in the coming weeks and months. Finally, speaking of Shelby. 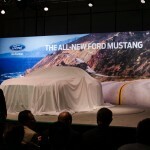 Ford did not announce any special edition or specially branded high-end version during this announcement. Caroll Shelby was featured prominently in the pre-launch festivities, so we have every reason to believe that there will be higher-horsepower Mustangs announced in the near future. Hopefully, they retain the Shelby nameplate. Overall, we like what we see. For people who look at the photos and think the car is not much to look at, we encourage them to see it in person before making a final judgement. It’s striking design may turn some people off, but we believe this redesigned Mustang captures the essence of the Mustang while appealing to a new generation of buyers (around the globe). Stay tuned to Motor Review for more Mustang news. Chad is a member of the Texas Auto Writers Association and the Midwest Automotive Media Association. 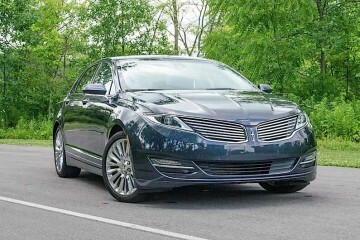 Lincoln MKZ 2.0L EcoBoost or 3.7L V6: What Should You Get?